Vitamin B12 plays an important role in many body functions, including red blood cell formation, DNA synthesis, hemoglobin synthesis and protein and fat metabolism. Vitamin B12 also plays an essential role in neurological function. Inadequate intake or absorption of this vitamin can lead to vitamin B12 deficiency, a condition characterized by a lack of healthy red blood cells. Symptoms of B12 deficiency include soreness of the mouth and tongue. Poor nutrition or inadequate intake of vitamin B12 can cause B12 deficiency. 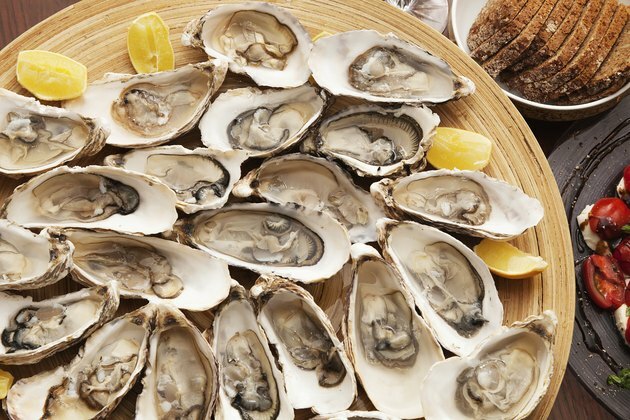 Vitamin B12 food sources include animal products such as meat, poultry, fish, clams, oysters, eggs and dairy products. Fortified breakfast cereals also provide vitamin B12. Vegetarians and vegans who do not eat animal products may not get enough vitamin B12, leading to a deficiency. Inability to absorb vitamin B12 can also lead to a deficiency. Several conditions can hinder the body's ability to absorb vitamin B12, including atrophic gastritis, pernicious anemia, celiac disease and Crohn's disease. Gastrointestinal surgeries can also reduce the body's ability to absorb B12. Doctors typically treat vitamin B12 deficiency with intramuscular injections of the vitamin to bypass absorption problems. High oral doses of B12 can also treat deficiencies in many cases. Vitamin B12 deficiency and other forms of anemia, including iron deficiency anemia, can cause a tongue condition called glossitis. Glossitis causes a loss of papillae and an appearance of smoothness on the tongue. Symptoms of glossitis include tongue inflammation and soreness and the appearance of a pinkish or redish color. Vitamin B12 deficiency can cause burning mouth syndrome, with symptoms such as dry mouth, increased thirst, sore mouth, taste loss or changes, tingling or numb sensations and burning sensations in the tongue, lips, gums, palate, throat or entire mouth. Symptoms of burning mouth syndrome can come and go intermittently and may worsen as the day progresses. Other nutritional deficiencies may cause burning mouth syndrome, including lack of zinc, iron and other B vitamins like folate, thiamin, riboflavin and pyridoxine. B12 deficiency and folate deficiency can also cause canker sores, or pale yellow ulcers with red outer rings. Fatigue, weakness, shortness of breath, dizziness or lightheadedness associated with low blood pressure, constipation, loss of appetite, weight loss, difficulty concentrating and pale skin are also signs of B12 deficiency. Prolonged or untreated vitamin B12 deficiency may lead to more serious neurological symptoms, including tingling or numbness in the hands and feet, difficulty maintaining balance, confusion, poor memory, depression and dementia. Consult your doctor if you suspect you have a vitamin B12 deficiency.